White spots on teeth are a result of enamel hypoplasia. Enamel Hypoplasia is the developmental disturbance of teeth characterized by deficient or defective enamel matrix formation. Overexposure to fluoride during the first eight years of life causes fluorosis. Most permanent teeth form at this time. A major cause of fluorosis is the inappropriate use of fluoride containing substances such as toothpaste and oral rinses. This occurs when children ingest fluoride toothpaste or fluoride rinses instead of spitting them out. Fluorosis is also caused when children take a fluoride supplement when unnecessary. Enamel hypoplasia can occur when the cells that make tooth enamel are affected by a high fever anytime from birth to age three. These lesions appear white or even sometimes brown. The appearance of a chalky white spot on a tooth is the earliest sign of decay indicating tooth decalcification. Proper oral hygiene measures can usually reverse tooth decalcification. 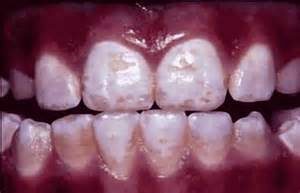 Conversely, lack of good oral hygiene causes decalcification to progress to full blown decay. Composite restorative material, or tooth colored fillings, may be used to blend white spots with natural tooth color. If the white spots are a cosmetic issue, the use of filling material or even veneers can be used to hide the white spots. If the decalcified areas reach beyond the enamel layer into the tooth, a filling restores the decayed area and a color is selected to blend with the natural tooth color. Most of the time white spots do not require any treatment. If the area is not a cosmetic problem and if the area is not decayed, then we observe the area for any changes. It is important to have your dentist evaluate any white spots to determine if any treatment is needed. 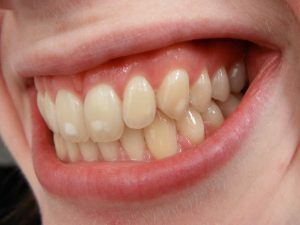 Please contact Adams and Cheek Dentistry at http://raleighncdentistry.com/contact-our-office/ with any questions concerning white spots on teeth. PreviousPrevious post:7 New Ways To Prepare For FallNextNext post:How Soon Should Your Child See the Orthodontist?